Zdravko Tolimir passed away last night in the UN Detention Unit (UNDU) in Scheveningen. The Medical Officer was called immediately and the Dutch authorities have commenced standard investigations as mandated under Dutch national law. Pursuant to his authority under the Statute of the Mechanism for International Criminal Tribunals (Mechanism) and the Rules of Detention of the International Criminal Tribunal for the former Yugoslavia (ICTY), applied mutatis mutandis to those under Mechanism authority at the Detention Unit, the Mechanism’s President, Judge Theodor Meron, has ordered a full inquiry to be conducted by the immediate past President of the International Criminal Tribunal for Rwanda, and a Judge of the Mechanism, Judge Vagn Joensen. Mr. Tolimir, a former Assistant Commander and Chief of the Sector for Intelligence and Security Affairs of the Main Staff of the Army of the Republika Srpska, was convicted by the ICTY for, among other crimes, genocide and conspiracy to commit genocide in the Srebrenica and Žepa enclaves in 1995. 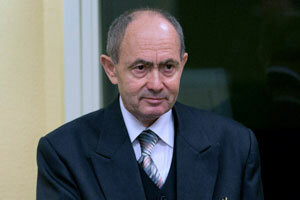 His sentence of life imprisonment was upheld by the ICTY Appeals Chamber last year. Following the issuance of the appeal judgement, and in accordance with the terms of UN Security Council Resolution 1966 (2010), the Mechanism assumed jurisdiction over all matters pertaining to Mr. Tolimir’s case. Mr. Tolimir was awaiting transfer to a State of enforcement at the time of his death. Zdravko Tolimir was initially indicted in 2005 and was arrested on 31 May 2007. On 12 December 2012, an ICTY Trial Chamber convicted Mr. Tolimir of genocide, conspiracy to commit genocide, crimes against humanity and violations of the laws or customs of war. On 8 April 2015, the ICTY Appeals Chamber upheld the Trial Chamber convictions and sentence of life imprisonment.